This delicious detox juice is easy on the digestive system and gently loosens any build up of mucus and waste that may have formed within the body overnight. Do you know all the amazing health benefits of Bentonite Clay? Watch this video to learn everything there is to know about Bentonite Clay. This video will go into great details about the type of bentonite clay you drink to the type you can use on your hair, skin and feet. If you enjoyed this video please share it with your friends and family. Juice fasting can be a powerful way of cleansing our body. There is no faster and more effective way to eliminate a host of toxins that you have accumulated for decades through processed foods, pesticides, herbicides, heavy metals, pharmaceutical drugs and other environmental contaminants. Before movies like Fat, Sick and Nearly Dead came out and popularized juice fasting for rapid physical healing, rejuvenation, and weight loss, juice fasting has been used to experience higher states of awareness, mental clarity and deep spiritual realizations. No matter what your intent is, juice fasting is guaranteed to produce massive changes in your physical, emotional, mental and spiritual health. In this blog post I am going to briefly discuss some important key points of juice fasting. 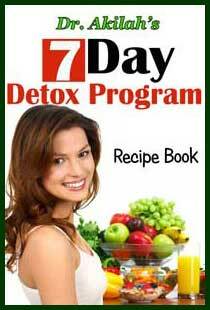 Juice fasting is a type of fasting and “detox diet” in which a person consumes only fruit and vegetable juices. Being available only in digestible carbohydrates, these foods are digested rapidly. People choose to undergo juice fasts for various reasons and via various methods. It’s easy to make your own juices–just buy a juicer, fruits and vegetables and some mason jars for storage, and you’re all set. But isn’t it easier to just buy a bunch of juices from the store, or through a cleansing program online? Sure it is, but it’s a lot pricier, and sometimes not always the healthiest route to go. Many bottled juices sold in grocery stores have extremely high sugar contents and artificial additives that almost cancel out their healthfulness of juice fasting entirely. If it’s freshly juiced at the store though, then it’s most likely pure juice with nothing else added. Just be sure to check the ingredients and double check with someone who works there. If you opt to juice at home, why not try these juice recipes from our website? Juice cleanses can last as long as you’d like them to. But if you’re just starting out, you might want to limit your first fast to four – five juices a day for two or three days so your body and mind have time to adjust. After all, it’ll probably be the first time you live off of liquids for a long period of time. And if you choose to do a second juice fast in the future, extending it to one week wouldn’t hurt. But listen to your body. If you feel faint, constantly hungry or nauseous, you may want to consult a doctor to find out if juice cleansing is right for you. How Much Juice Should I Drink During a Juice Fast? Many people make the mistake of not drinking enough juice. Not drinking enough juice can cause very unpleasant healing reactions and ravenous hunger. This is not about hunger or deprivation – this is about nourishing and healing the body. Drink as much juice as desired. Drink at least a gallon per day, and more if there is hunger. If there is hunger, it means not enough nutritionally based juice is being consumed. Ideally, it should actually feel as if one is drinking too much juice. 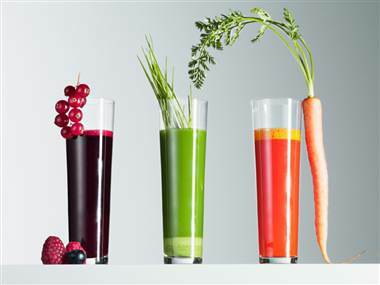 So remember, when it comes to juice fasting, more is better. Place everything except the aloe into a juicer. Use a 16 oz container to catch all the juice. You can also use a high power blender and strain the pulp afterwards. Add the aloe vera juice or gel, mix and drink. 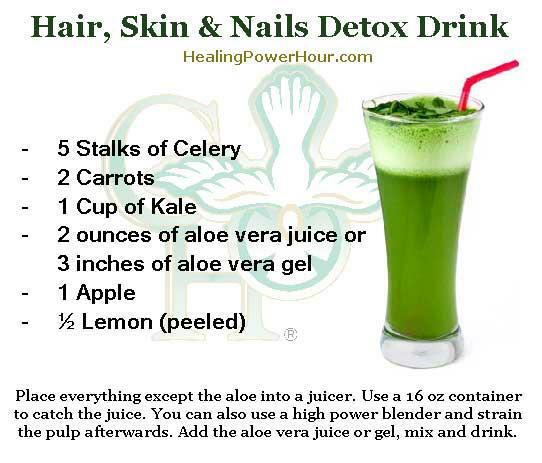 This drink provides a combination of nutrients, including Vitamin C and Biotin, that support the structural foundation of your hair, skin and nails. Don’t have time to buy this delicious drink? No problem. Buy the supplement version by clicking on the link below.